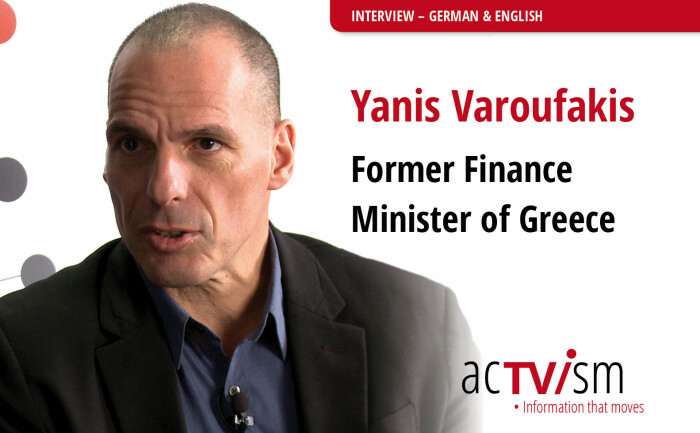 In this video, acTVism Munich interviews Yanis Varoufakis, a world renowned economist who was a former member of the Greek parliament. He gained immense popularity when he served as finance minister (27 January 2015 – 6 July 2015) for the Greek government, a post that he left shortly after he found out that Greek government made the decision to implement the austerity package of the Troika against the popular vote (OXI) of the Greek people . This interview focuses on the history of the global economic system, the transformations that it underwent after World War II and attempts to connect it to the current economic crisis that is sweeping throughout Europe and the globe. Is there such a thing as a “Greek-crisis”? Are pensions, social security benefits & high-wages the reasons why we are facing an economic downturn or are there underlying factors involved? What is the history of the global capitalist system and how is it affecting states and individuals today? These questions are answered in the video available here in English and German (with transcripts).